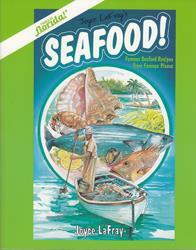 University Press of Florida: Seafood! This collection of awe-inspiring seafood recipes from Florida’s best restaurants will help you prepare those same dishes in your own home. Here you’ll find easy recipes for appetizers, soups and chowders, salads, entrees and sauces for such colorful favorites as blue and stone crab, red snapper and yellowtail, as well as grouper, lobster, shrimp, and scallops. Never before has a book on real Florida seafood been as much fun!